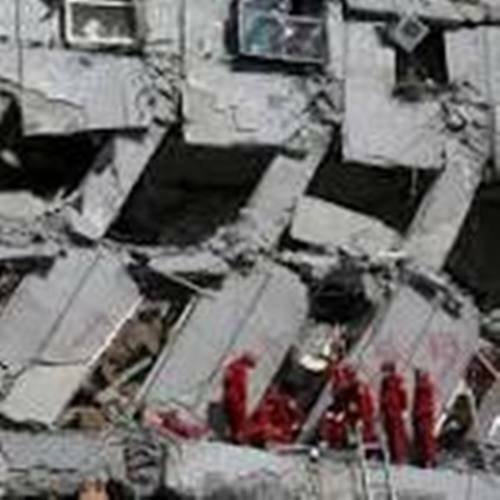 TAINAN, Taiwan – With anxious families waiting nearby, rescuers on Sunday painstakingly pulled more survivors from the remains of a high-rise apartment building that collapsed a day earlier in a powerful earthquake that shook southern Taiwan and killed at least 26 people. More than 100 remained buried in the building’s rubble. “He said that ‘maybe your home is damaged, but memories of the family can last,'” Wang said. 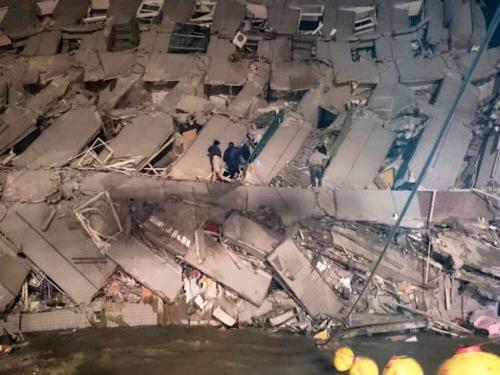 Tainan Mayor Lai Ching-te said authorities estimated that 124 people were still trapped, many at the bottom of the wreckage. He said rescuers were able to reach many people by using information from residents who got out about the possible locations of those still inside. The death toll was rising in the historic city of Tainan, which bore the brunt of the 6.4-magnitude quake, as rescuers scoured rubble for survivors. An entire residential complex of four buildings containing almost 100 homes toppled, left on its side with twisted metal girders exposed and clouds of dust rising from the jumbled concrete. The official CNA news agency reported that the quake killed 14 people and injured 484 others, according to statistics by Taiwan’s rescue authorities. Most of the injured had been released from hospitals by Saturday night. CNA said 153 people remained missing and that rescuers were racing to find them. Taiwan’s SETV reported that 101 adults and 41 children were missing. The number of missing was expected to drop because some of those listed might have been listed twice, hospitalized or not in the building at the time of the quake. Officials said four buildings collapsed in the quake which struck the island in the early hours of the morning, but rescue efforts are centring on the tower block that tumbled onto its side. Firefighters pulled survivors from the twisted concrete, trying to access apartments through windows and scaling the rubble with ladders. Around 800 troops have been mobilised to help the rescue effort, with sniffer dogs also searching through the rubble. The baby, a man and a woman were pulled dead from the block, officials said, with 29 residents taken to hospital. “These three people showed no signs of life before they were sent to the hospital,” said Lin Kuan-cheng, spokesman for the National Fire Agency. Residents at the felled Wei-kuan Building told of their terror as the quake hit, with survivors pulled bleeding and crying from the ruins, some just in their underwear. “I saw buildings shake up and down and left and right,” said one resident. “The first and second floor just collapsed,” he told local channel SET TV. Another man tied his clothes together to create a rope and lowered himself from his home on the ninth floor to the sixth floor below, Apple Daily reported. One woman told how she had fought her way out of her home. “I used a hammer to break the door of my home which was twisted and locked, and managed to climb out,” she told SET TV, weeping as she spoke. Rescuers have freed more than 250 people from the apartment complex, with over 40 of them hospitalised. “We are concerned that most members of those families may have returned for the coming new year holiday,” he said. Heartfelt appeals for the missing were posted on social media. “My friend in Wei-kuan is currently missing. His brother is waiting at the scene and other relatives are at the hospital looking among those injured. If anyone has related news, please get in touch,” one user called applexgreen posted on Taiwan’s popular PTT forum. Another named Ahan asked for information on a family of three with a two-year-old son who lived on the seventh floor of the building. “My mother is the child’s nanny. We haven’t been able to get in contact,” the post said. Officials were unable to give an estimate of how many were still trapped as they scoured the building. As dawn broke, live Taiwanese TV showed survivors being brought gingerly from the building, including an elderly woman in a neck brace and others wrapped in blankets. The trappings of daily life — a partially crushed air conditioner, pieces of a metal balcony, windows — lay twisted in what appeared to be nearby rubble. One woman told how she had fought her way out of her home in one of the collapsed blocks. “I used a hammer to break the door of my home which was twisted and locked, and managed to climb out,” she told local channel SET TV, weeping as she spoke. Men in camouflage uniforms, apparently military personnel, marched into one area of collapse carrying large shovels. Aerial images of at least two different buildings showed what appeared to be significant devastation. It was unclear if both were residential structures. The Taiwanese news website ET Today reported a mother and a daughter were among the 34 people pulled from one of the Wei Guan buildings and that the girl drank her urine while waiting for rescue, which came sooner than expected. The temblor struck about 4am local time. It was located some 36km southeast of Yujing, and struck about 10km underground, according to the US Geological Survey. It was felt as a lengthy, rolling shake in the capital, Taipei, on the other side of the island. But Taipei was quiet, with no sense of emergency or obvious damage just before dawn. Officials said there were 256 people registered as living in the complex, which contained 96 apartments. Dazed and exhausted residents stood outside the toppled buildings, watching rescue workers free survivors — from infants to the elderly, some strapped to stretchers — and carefully hand them down ladders. Cranes towered over the disaster zone with diggers trying to move slabs of concrete. Eight shelters have been set up around the city, with over 100 people taking refuge there, while restaurants and hotels offered free food and rooms to residents. “The buildings collapsed, but Tainan will stand again! Please treat here like your temporary home, rest well and freshen up. You aren’t alone,” said one Tainan hotel called Adagio Travel on its Facebook page. Separately, at least 30 people were earlier freed from another residential seven-storey tower. Officials said several blocks had collapsed or half collapsed in other parts of the city, with some buildings left leaning at alarming angles. Across Tainan, more than 400 people were injured, with over 60 hospitalised. Around 400,000 had been left without water, authorities said, and more than 2,000 homes are still without electricity. China has offered rescue assistance if needed, according to state news agency Xinhua. 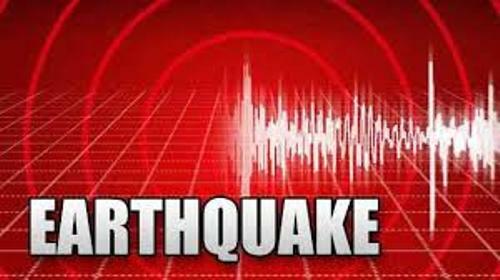 The quake struck at a depth of 10 kilometres (six miles) at around 4:00am (2000 GMT Friday), 39 kilometres northeast of Kaohsiung, Taiwan’s second-largest city. The Pacific Tsunami Warning Center said a destructive Pacific-wide tsunami was not expected. A strong 6.3-magnitude quake which hit central Taiwan in June 2013 killed four people and caused widespread landslides. A 7.6-magnitude quake struck the island in September 1999 and killed around 2400 people. Geologists from Brown University may have finally explained what triggers certain earthquakes that occur deep beneath the Earth’s surface in subduction zones, regions where one tectonic plate slides beneath another. Subduction zones are some of the most seismically active areas on earth. Earthquakes in these spots that occur close to the surface can be devastating, like the one that struck Japan in 2011 triggering the Fukushima nuclear disaster. 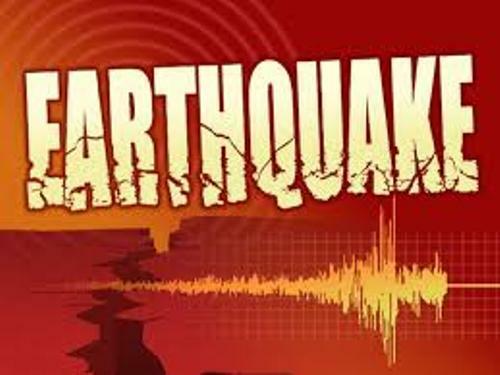 But quakes also occur commonly in the subducting crust as it pushes deep below the surface — at depths between 70 and 300 kilometers. These quakes, known as intermediate depth earthquakes, tend to be less damaging, but can still rattle buildings. Intermediate depth quakes have long been something of a mystery to geologists. But through a series of lab experiments, Hirth and postdoctoral researcher Keishi Okazaki have shown that as water escapes from a mineral called lawsonite at high temperatures and pressures, the mineral becomes prone to the kind of brittle failure required to trigger an earthquake. The work will be published on February 4, 2016 in the journal Nature. The experiments were done in what’s known as a Grigg’s apparatus. Okazaki placed samples of lawsonite in a cylinder and heated it up through the range of temperatures where water becomes unstable in lawsonite at high pressures. A piston then increased the pressure until the mineral began to deform. A tiny seismometer fixed to the apparatus detected sudden cracking in the lawsonite, a signal consistent with brittle failure. 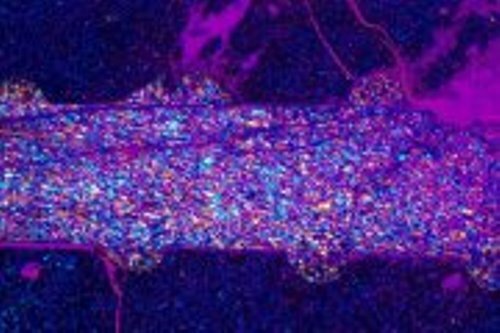 Okazaki performed similar experiments using a different mineral, antigorite, which had been previously implicated as contributing to intermediate depth seismicity. In contrast to lawsonite, the antigorite failed more gradually — squishing rather than cracking — suggesting that antigorite does not play a role in these quakes. 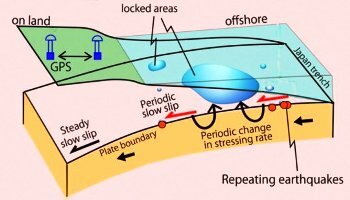 If lawsonite is indeed responsible for intermediate depth earthquakes, it would explain why such quakes are common in some subduction zones and not others. The formation of lawsonite requires high pressures and low temperatures. It is found in so-called “cold” subduction zones in which the suducting crust is older and therefore cooler in temperature. One such cold zone is found in northwest Japan. But conditions in “hot” subduction zones, like the Cascadia subduction zone off the coast of Washington state, aren’t conducive to the formation of lawsonite. Ultimately, Hirth says research like this might help scientists to better understand why earthquakes happen at different places under different conditions. UPDATE :Can Slow Creep Along Thrust Faults Help Forecast Megaquakes? The scientists studied 28 years of earthquake measurements, looking at quakes of magnitude 2.5 or greater between 1984 and 2011. They discovered 1,515 locations off the coast of Japan where small repeating earthquakes happen — 6,126 quakes in all. According to co-author Robert Nadeau, a UC Berkeley seismologist and a fellow with the Berkeley Institute for Data Science (BIDS), an analysis of these quakes found that larger, more destructive earthquakes — those of magnitude 5 or greater — occurred much more frequently when the periodic slow-slip was fastest. This included the great Tohoku-oki earthquake, which also devastated a nuclear power plant and led to widespread radioactive contamination. Nadeau and the late UC Berkeley seismologist Thomas McEvilly showed 12 years ago that periodic slow slip occurred all along the San Andreas Fault, from Parkfield to Loma Prieta, Calif. In 2009 the group also observed deeper, transient and periodic slow-slip on the San Andreas — this time associated with faint shaking called tremor — and that it was linked with two larger quakes occurring in 2003 and 2004 at San Simeon and Parkfield, Calif. respectively. Author Mitch BattrosPosted on February 6, 2016 Categories EarthquakesTags Can slow creep along thrust faults help forecast megaquakes?